Objective: To assess the risk of ocular damage from 4 types of light curing units (LCUs) and to estimate the maximum permissible ocular exposure times from each LCU during an 8-hour workday. Methods: Extracted human maxillary teeth were mounted in a dentoform. Four types of LCUs (plasma arc, low-power and high-power light-emitting diode, and quartz–tungsten–halogen) were used to cure a simulated restoration in the maxillary central incisor from the facial and palatal aspects. To simulate ocular exposure, the spectral irradiance (W/[cm2·nm]) from the LCUs was measured 5 times at each of 3 distances (30 cm, 50 cm and 100 cm) from the tooth, using a cosine-corrected probe attached, via a fibre optic cable, to a calibrated spectroradiometer. The weighted blue-light and effective ultraviolet (UV) irradiances that would be received by the eye from each LCU were calculated. Results: The maximum permissible daily exposure limits for UV light exceeded 8 hours at all distances and orientations. The maximum permissible cumulative daily exposure time to blue light was as low as 6 seconds when curing from the palatal aspect with the plasma arc LCU and as high as 1.5 hours when the low-power light-emitting diode LCU was used from the facial aspect. Conclusions: The 4 LCUs tested did not pose a risk of UV-mediated ocular damage. The higher-powered lamps showed potential to cause blue-light–mediated ocular damage at shorter distances, with damage potentially occurring after cumulative viewing of only 6 seconds at the 30-cm distance during an 8-hour workday. Dental curing lights have many applications in dentistry, including photopolymerization of resins for pit and fissure sealants, cavity restorations, bonding of indirect restorations, orthodontic bonding and tooth bleaching. Most of these lights emit intense blue light in the 400- to 500-nm wavelength range, and some also emit in the ultraviolet A (UVA) range (315–400 nm).1-3 Although blue light (and, for some resins, UVA light) is essential for the polymerization reaction to occur in light-cured resins,2,4-6 prolonged exposure to blue and UVA light has adverse health effects, especially ocular damage. The greatest ocular hazard related to blue light occurs at about 440 nm (close to the peak wavelength of many light-emitting diode curing lights), whereas the maximum UV hazard peaks at 270 nm.7 Blue light is transmitted through the ocular media and absorbed by the retina. At chronic low levels of exposure, the blue light amplifies retinal aging and degeneration by causing photochemical injury to the pigmented epithelium and choroid of the retina.8,9 The clinical manifestations of retinal damage include acute photoretinitis and, in severe cases, premature age-related macular degeneration.9 In contrast, UV light is primarily absorbed by the conjunctiva, cornea and lens before it reaches the retina. Therefore, UVA radiation causes corneal injury or photokeratitis, as well as cataractogenesis, the transient or permanent opacification of the lens,10 and personnel who use curing lights on a daily basis may be at risk for ocular damage. It appears that no Canadian standards for maximum daily exposure to blue light are available, but the American Conference of Governmental Industrial Hygienists (ACGIH) has published recommendations for maximum daily exposure to blue and UV light.7 Based on data from animal studies and accidental human exposure, the ACGIH guidelines set threshold limits for exposure to blue and UV light below which human ocular injury is highly unlikely to occur. In the 1980s, studies assessing the ocular hazard of quartz–tungsten–halogen (QTH) light curing units (LCUs) found that these relatively low-power units had little potential to cause ocular injury.11-13 The QTH units studied in the 1980s delivered irradiances of about 300 mW/cm2, but the high-power plasma arc (PAC) and light-emitting diode (LED) curing lights used today deliver much higher irradiances, up to 3000 mW/cm2 or more, and have very different spectral emissions.11-16 To date, no data have been published regarding the safety of these newer-generation, high-power PAC and LED units. The purpose of this study was to evaluate the potential for blue and UV light from currently available models of PAC, LED and QTH dental curing lights to damage the eye. A total of 4 LCUs (PAC, low-power LED, high-power LED and QTH) were evaluated (Table 1). Each LCU was positioned to simulate curing of a restoration in an extracted human maxillary central incisor, presented in a dentoform set-up, from either the palatal or the facial direction (Fig. 1). To simulate usual clinical practice, a rubber dam was used, and the teeth were kept slightly moist. The spectral irradiance (W/[cm2·nm]) that the eye would receive during curing of the restoration was measured with a laboratory-grade light detector (3.9-mm diameter CC3-UV probe, Ocean Optics, Dunedin, FL) attached by a 1-mm fibre optic cable to a fibre optic spectroradiometer (USB 4000, Ocean Optics), which had a spectral range of 300 to 890 nm, fully covering the spectral emission from the LCUs. This detector was chosen because its diameter (3.9 mm) is similar to that of the human pupil. The irradiance received by the detector was measured at 30, 50 and 100 cm from the maxillary central incisor to simulate clinically relevant distances between a light source and the eyes of the operator (30 cm), a dental assistant (50 cm) and an onlooker in the operatory (100 cm). The equipment was calibrated to a National Institute of Standards and Technology (NIST, Gaithersburg, MD) referenced light source and zeroed to ambient light. Figure 1: Photograph of extracted human maxillary teeth in a dentoform, showing position of the light guides as applied from the palatal (left) and facial (right) aspects. When the lights were used from the palatal aspect, with the surface of the light guide oriented parallel to the inner surface of the tooth at a distance of 1 mm, about half of the light guide extended past the incisal edge of the tooth. When the lights were used from the facial aspect, the surface of the light guide was positioned such that light would be incident on the tooth at an angle of about 45° at a distance of 3 mm. Thus, for curing from the palatal aspect, the light was directed at the detector, and for curing from the facial aspect, light reflected from the illuminated tooth was the major source of radiation. At each distance, the position of the detector was adjusted to achieve maximum irradiance. Measurements were repeated 5 times over a 3-week period and averaged to account for variability among clinical personnel in positioning of light guides and detectors. As well, the spectral emission and total radiant power of each curing light was measured at 0 cm from the light guide using the spectroradiometer attached to an NIST-calibrated integrating sphere. In accordance with the guidelines set by the ACGIH, the spectral emission of each curing light was weighted according to the potential of its blue-light and UV irradiances to produce ocular damage. The spectrally weighted bluelight and UV irradiances were calculated with the functions published by the ACGIH (p. 146–155),7 as presented below. At a distance of 0 cm, all of the LCUs delivered peak irradiance values within the blue-light region (400–500 nm), and 2 of the units (the Sapphire PAC and Optilux 501 QTH units) also delivered below 400 nm (Fig. 2). The spectral irradiance was negligibly small for wavelengths shorter than 380 nm because of optical filters within these LCUs that filter out the shorter wavelength UV light. Figures 3 and 4 show the spectral emission measured at 30 cm from each curing light when applied from the palatal and facial aspects, respectively. Figures 5 and 6 show the dependence of the weighted blue-light and effective UV irradiances, respectively, with increasing distance (d) from the tooth. For an ideal source radiating isotropically across all directions, the irradiance would decrease with increasing distance as 1/d 2 (i.e., with an exponent of –2). The results obtained show behaviour that is very similar to that of an ideal source at distances from 30 to 100 cm. Figure 2: Spectral emission at a distance of 0 cm for the 4 light curing units used in this study. Total radiant power (mean ± standard deviation) was 826 ± 2 mW for the plasma arc (PAC) unit, 325 ± 1 mW for the low-power light-emitting diode unit (LP LED), 740 ± 2 mW for the high-power light-emitting diode unit (HP LED) and 630 ± 5 mW for the quartz–tungsten–halogen (QTH) unit. 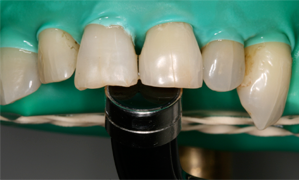 Figure 3: Spectral irradiance received at 30 cm from the tooth when the light curing units were applied to the maxillary central incisor from the palatal direction. PAC = plasma arc, LP LED = low-power light-emitting diode, HP LED = high-power light-emitting diode, QTH = quartz–tungsten–halogen. Figure 4: Spectral irradiance received at 30 cm from the tooth when the light curing units were applied to the maxillary central incisor from the facial direction. PAC = plasma arc, LP LED = low-power light-emitting diode, HP LED = high-power light-emitting diode, QTH = quartz–tungsten–halogen. Figure 5: Weighted irradiance values for blue light for the 4 light curing units, displayed on a logarithmic scale. The data show a trend for decreasing values with increasing distance. The solid lines are least-square fitted to the data points with a slope of –1.8. PAC = plasma arc, LP LED = low-power light-emitting diode, HP LED = high-power light-emitting diode, QTH = quartz–tungsten–halogen. Figure 6: Effective irradiance values for ultraviolet light for the plasma arc (PAC) and quartz–tungsten–halogen (QTH) light curing units, displayed on a logarithmic scale. The data show a trend for decreasing values with increasing distance. The solid lines are least-square fitted to the data points with a slope of –1.8. Table 2 displays measured irradiance values for each light at 30, 50 and 100 cm from the tooth for both aspects (palatal and facial). At all 3 distances from the tooth, the blue-light irradiance was greatest for the Sapphire PAC light and least for the Optilux 501 QTH light for the palatal aspect (Table 3). For the facial aspect, irradiance was greatest for the Elipar S10 HP LED light and least for the SmartLite IQ2 LP LED light (Table 3). For all LCUs, the blue-light irradiance decreased with increasing distance from the light source, and was greater for curing from the palatal aspect than for curing from the facial aspect at all distances. The effective UV irradiance was minimal for all curing lights at all 3 distances (Table 4). The maximum daily permissible exposure times to blue light were lower with curing from the palatal aspect than when curing from the facial aspect, and these exposure times increased as the distance from the light source increased (Table 5). For UV light, the maximum permissible duration of cumulative exposure exceeded 8 hours a day under all curing conditions. The International Organization for Standardization (ISO) 10650-1 standard for halogen curing lights17 limits the irradiance in the region from 190 to 385 nm to no more than 200 mW/cm2. None of the LCUs tested exceeded this limit and no radiation was detected below 360 nm from any unit. In an 8-hour workday, the TLV is 10 mJ/cm2 for exposure to blue light and 3 mJ/cm2 for exposure to UV radiation.7 Two of the LCUs tested (Sapphire PAC, Optilux 501 QTH) had spectral emissions extending into the UVA range. The 2 LED units had no spectral emissions below 400 nm. The effective UV irradiance was negligible for all lights under all curing conditions (Table 4). Correspondingly, the maximum permissible cumulative exposure times to UV radiation would not be reached in an 8-hour workday. Dental personnel are therefore not at risk for UV-mediated ocular damage from the 4 LCUs tested, if used under the conditions evaluated in this study. In the present study, the PAC unit delivered both the greatest total radiant power and the greatest weighted blue-light irradiance, because most of its spectral emission lies within the blue-light range. The peak irradiance values of the low-power and high-power LED units were close to the wavelength at which maximum bluelight hazard occurs (440 nm). As such, the LED units displayed a greater blue-light–weighted irradiance than would be expected from their narrow spectral emissions. When the LCUs were used from the palatal aspect, about half of the light guide extended past the incisal edge of the tooth, because of the size of the light guide, the size of the tooth and the presence of the rubber dam. This simulation reflected clinical reality, and the situation could be even worse if more of the light guide tip were to extend past the incisal edge of the tooth. The eye has a natural aversion response to bright light, which usually limits single exposures to less than 0.25 seconds; however, it has been reported that because LED units emit a relatively narrow band of radiation, they do not always evoke this aversion response.8 For the blue-light hazard, the ACGIH-determined maximum permissible cumulative exposure times were clinically relevant when the detector (the simulated eye) was at distances of 30 and 50 cm from the light source (Table 5). The shortest permissible cumulative daily exposure times and the greatest potential for retinal damage occur when the light guide is positioned on the palatal aspect of the tooth, with partial exposure past the incisal edge of the tooth (Fig. 1). The shortest permissible cumulative daily exposure (5.96 seconds) occurred with the PAC light for curing from the palatal position. For an operator whose eyes are 30 cm from a palatally positioned light guide, the maximum daily exposure limit would be exceeded after two 5-second curing cycles with this PAC unit, after two 20-second cycles with the HP LED unit, and after four 20-second cycles with the LP LED light or the QTH units. In practice, dental personnel may work with their eyes even closer than 30 cm from the light source; in such cases, the maximum permissible daily exposure would be even shorter than those calculated here. Similarly, for dental personnel positioned 50 cm from a palatally positioned light guide, the maximum daily exposure limit would be exceeded after four 5-second curing cycles with the PAC unit, after four 20-second cycles with the HP LED unit, after eight 20-second cycles with the LP LED unit and after nine 20-second cycles with the QTH unit. These limits represent the cumulative permissible exposure within an 8-hour period, so they might easily be reached during the normal workday of dental personnel. If the operator does not wear protective glasses and looks at the light for only the first second of the curing cycle, before averting the eyes, he or she is still at risk: with 1-second exposures to the PAC unit, it would take as few as 7 curing cycles to exceed the maximum daily cumulative exposure. With LCUs becoming ever more powerful over time, this maximum daily cumulative exposure time will decline. The ACGIH provides guidelines for exposure to blue and UV light, but there are currently no restrictions on the maximum irradiance of dental curing units that emit light in the 400- to 515-nm range,17 nor are there regulations or standards governing how long they can be used on patients. Ordinary prescription glasses do not prevent penetration of blue or UV light.18 Most manufacturers of dental LCUs supply protective eyewear, but this protection is not universally used. Anyone who uses a curing light should be cognizant of the ocular risk to both the user and the patient. Both parties should wear protective eyeglasses that have been designed to filter out the harmful wavelengths from the particular LCU.18,19,20 Some glasses that filter blue and UV light have been shown to reduce the transmission of light below 500 nm to less than 1%.11,18,20 In the worst-case scenario, an operator using appropriate eye protection could safely look at the PAC unit at a distance of 30 cm for a total of 10 minutes a day; this cumulative duration would be reached after one hundred and twenty 5-second curing cycles with the PAC light. Although this duration of exposure is not recommended, it does indicate the degree of safety that can be achieved by using the correct protective glasses. The eyes of dental personnel may easily be exposed to unsafe cumulative levels of radiation from dental LCUs. Higher-powered LCUs showed the potential to cause ocular damage mediated by blue light at shorter distances, with the potential damage occurring after cumulative viewing of about 6 seconds at a distance of 30 cm (over an 8-hour workday). Appropriate protective eyewear should be used to eliminate this hazard. Dr. Labrie is associate professor in the department of physics and atmospheric science, Dalhousie University, Halifax, Nova Scotia. Dr. Moe is a resident in oral and maxillofacial surgery at Emory University, Atlanta, Georgia. Dr. Moe was a dental student at Dalhousie University when this research was conducted. Dr. Price is a professor in the department of dental clinical sciences, Dalhousie University, Halifax, Nova Scotia. Mr. Young is a research assistant in the department of dental clinical sciences, Dalhousie University, Halifax, Nova Scotia. Mr. Felix is a research associate in the department of dental clinical sciences, Dalhousie University, Halifax, Nova Scotia. Acknowledgements: Dalhousie University and a NSERC Discovery Grant #298326 supported this study. Vandewalle KS, Roberts HW, Andrus JL, Dunn WJ. Effect of light dispersion of LED curing lights on resin composite polymerization. J Esthet Restor Dent. 2005;17(4):244-54; discussion 254-245. Uhl A, Sigusch BW, Jandt KD. Second generation LEDs for the polymerization of oral biomaterials. Dent Mater. 2004;20(1):80-7. Price RB, Felix CA, Andreou P. Third-generation vs a second-generation LED curing light: effect on Knoop microhardness. Compend Contin Educ Dent. 2006;27(9):490-6; quiz 497, 518. Park YJ, Chae KH, Rawls HR. Development of a new photoinitiation system for dental light-cure composite resins. Dent Mater. 1999;15(2):120-7. Ye Q, Wang Y, Williams K, Spencer P. Characterization of photopolymerization of dentin adhesives as a function of light source and irradiance. J Biomed Mater Res B Appl Biomater. 2007;80(2):440-6. Neumann MG, Miranda WG Jr, Schmitt CC, Rueggeberg FA, Correa IC. Molar extinction coefficients and the photon absorption efficiency of dental photoinitiators and light curing units. J Dent. 2005 Jul;33(6):525-32. Epub 2005 Mar 19. American Conference of Governmental Industrial Hygienists. Threshold limit values for chemical substances and physical agents and biological exposure indices. Cincinnati, OH: American Conference of Governmental Industrial Hygienists; 2008. p. 146-55.
International Commission on Non-Ionizing Radiation Protection. Guidelines on limits of exposure to broad-band incoherent optical radiation (0.38 to 3 μm). Health Physics. 1997;73(3):539-54. Ham WT Jr, Ruffolo JJ Jr, Mueller HA, Clarke AM, Moon ME. Histologic analysis of photochemical lesions produced in rhesus retina by short-wave-length light. Invest Ophthalmol Vis Sci. 1978;17(10):1029-35.
International Commission on Non-Ionizing Radiation Protection. Guidelines on limits of exposure to ultraviolet radiation of wavelengths between 180 nm and 400 nm (incoherent optical radiation). Health Phys. 2004;87( 2):171-86. The effects of blue light on the retina and the use of protective filtering glasses. Council on Dental Materials, Instruments, and Equipment. J Am Dent Assoc. 1986;112(4):533-5. Foster CD, Satrom KD, Morris MA. Potential retinal hazards of dental visible-light resin curing units. Biomed Sci Instrum. 1988;24:251-7. Satrom KD, Morris MA, Crigger LP. Potential retinal hazards of visible-light photopolymerization units. J Dent Res. 1987;66(3):731-6. Feng L, Carvalho R, Suh BI. Insufficient cure under the condition of high irradiance and short irradiation time. Dent Mater. 2009;25(3):283-9. Staudt CB, Mavropoulos A, Bouillaguet S, Kiliaridis S, Krejci I. Light-curing time reduction with a new high-power halogen lamp. Am J Orthod Dentofacial Orthop. 2005;128(6):749-54. Mavropoulos A, Cattani-Lorente M, Krejci I, Staudt CB. Kinetics of light-cure bracket bonding: power density vs exposure duration. Am J Orthod Dentofacial Orthop. 2008;134(4):543-7.
International Organization for Standardization. Dentistry — Powered polymerization activators -- Part 1: Quartz tungsten halogen lamps. ISO International Standard 10650-1. Geneva, Switzerland; 2004. Bruzell Roll EM, Jacobsen N, Hensten-Pettersen A. Health hazards associated with curing light in the dental clinic. Clin Oral Investig. 2004;8(3):113-117. Moseley H, Strang R, MacDonald I. Evaluation of the risk associated with the use of blue light polymerizing sources. J Dent. 1987;15(1):12-5. Bruzell EM, Johnsen B, Aalerud TN, Christensen T. Evaluation of eye protection filters for use with dental curing and bleaching lamps. J Occup Environ Hyg. 2007;4(6):432-9.